Our Fellowship (MMF) is made up of twenty households, meeting informally for worship and fellowship at 9:30 am Sundays in the Gardner Hall of Erindale United Church (EUC). 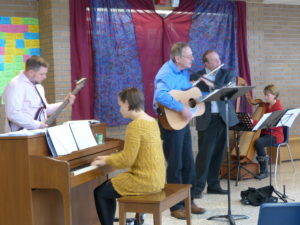 One of us serves as worship leader to direct the service which typically begins with singing, prayer and a sharing time for any and all to tell about joys, celebrations and happenings in their lives as well as concerns and struggles that may be weighing on their hearts and needing prayer support. A children’s story is included, after which the younger children are excused to their Sunday school session. Sermons are presented on various Sundays by pastor Stephen Reist, by invited guest speakers, and by MMF participants. After the service, there is time to enjoy coffee and goodies with fellowship to catch up on folks perhaps not seen for a week or more; or to welcome and make acquaintance with visitors. Then adults “gather around” for discussion … of the morning’s theme and the sermon, or of some other issue of interest to all present. To find MMF, find your way to the intersection of Erin Mills Parkway and Dundas Street. Head east on Dundas past Mississsauga Road and the Credit River. Up the hill from the Credit River valley, watch for the Erindale United Church sign on your right. Come in the front door, then head right … to Gardner Hall. That’s where we meet. Here at MMF, children are a valued part of our fellowship. During the start of our Sunday morning service, children sit with their families. After worship, prayer and a time of sharing, children are invited to the front to take part in our children’s story time. 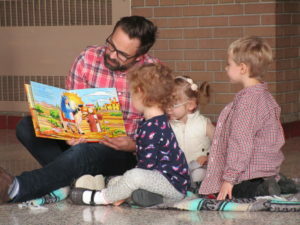 After story time, children (ages 2 and up) may leave for Sunday school to enjoy a time of stories, songs, crafts, and snacks, or remain with their family in the service. We do not provide nursery care, however infants and young children are welcome in the service with their parents or caregivers, and a small area in the back is available for young ones to play quietly with their caregiver while still remaining part of the service.